The Cotswolds is one of the most beautiful rural areas of England. Situated to the west of Oxford, it is an area of rolling hills, wooded valleys, fields of sheep and flowers, and, the reason for its fame and popularity, wonderful honey-coloured villages. Quintessential England! Stratford-upon-Avon is famous worldwide as the birthplace of the English language's greatest playwright, William Shakespeare, and with its old medieval charm it is the perfect starting point for the day. William Shakespeare's birthplace and grave. 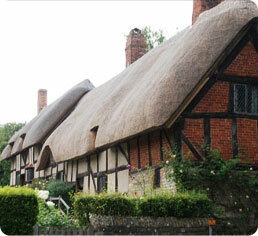 First we head for Stratford to spend the morning wandering its pretty streets with their 500-year-old timber buildings. 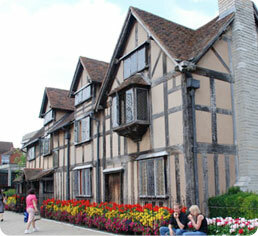 Your guide will introduce you to the life and times of William Shakespeare. You will have free time to visit his birthplace house in the centre of the town and to see his grave at Holy Trinity Church. The Cotswolds itinerary depends on the weather. If the weather is good, we will take some short unchallenging hill climbs so good walking footwear is recommended. However, whatever the weather we will visit the rural villages of Chipping Campden, Lower Slaughter and Bourton-on-the-water passing through the winding country lanes and over the undulating pastures. You will have time to browse the shops and relax in the many cafes that flank the pretty River Windrush that flows through the heart of the village of Bourton. Back to Cambridge mid-evening. Stratford-upon-Avon 3 hours; There will be several village stops and viewpoint stops depending on the weather.